Live Christmas trees don’t have to come from the lot. Make your holiday grander and more earth-friendly with a tree fresh from the farm! If cutting down a Christmas tree has you conjuring up visions of the Griswolds trekking through the forest and crashing into a snow bank, not to worry: Maryland tree farmers have got you covered! All you have to do is visit a farm, pick out your favorite, and cut it down. The tree farm will shake it, bale it, and help you attach it to your car, avoiding certain disaster. 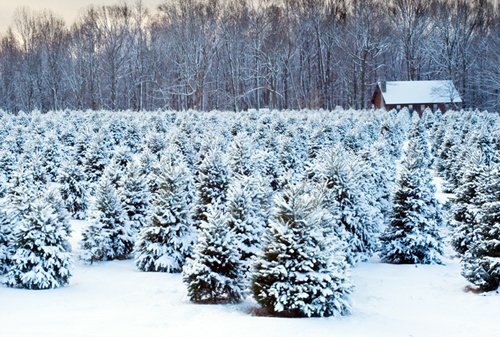 Here are four Maryland tree farms where you can get the perfect holiday tree while helping to support local farmers. Gaver Farm is a one-stop shop for all your Christmas greens needs! Cut your own tree (ranging from $55 to $100 in price) from varieties like Blue Spruce, Douglas Fir, Fraser Fir, and Scotch Pine. Step inside the wreath shop, and you’ll find decorated wreaths, centerpieces, swags, and window boughs. Gaver also has a farmers market and bakery serving up goodies like hot donuts, pies, and kettle corn. The farm is open daily from 9 a.m. to 5 p.m. through Dec. 23, 2018. Clemsonville is one of the most affordable cut-your-own farms in Maryland! All trees are priced at $25, and that even includes the use of saws and twine. This Frederick County family farm is also known for its unique holiday feature, the Everlasting Tree. The “tree” is a 50-foot limestone rock formation in the shape of a Christmas tree, complete with a star at the top. The Clemsonville Tree Farm is open daily from 10 a.m. to 5 p.m. through Christmas Eve (or until all the trees are gone)! Located in Western Howard County, Triadelphia Lake View Farm is the perfect place for a weekend holiday outing. On the weekends, you’ll find Santa in his workshop waiting to visit with good little boys and girls, and afterward, you can visit the snack shack for a warm-up with a hot cocoa. Tree prices range from $45 to $60 and include shaking, baling, and drilling. If cutting-your-own isn’t your thing, TLV also has some pre-cut trees available. The farm is open Monday through Thursday from noon to 5 p.m., and 9 a.m. to 5 p.m. on weekends. Marking 41 years in the business, Pine Valley Farms has one of the largest selections of tree varieties in Maryland. Trees range in size from 5 to 12 feet tall, and availability is conveniently listed on the website. Be sure to bring cash or your checkbook, because the farm does not accept credit cards! Stop into the Christmas barn for some hot cider, and shop the fresh wreaths and other holiday decorations. 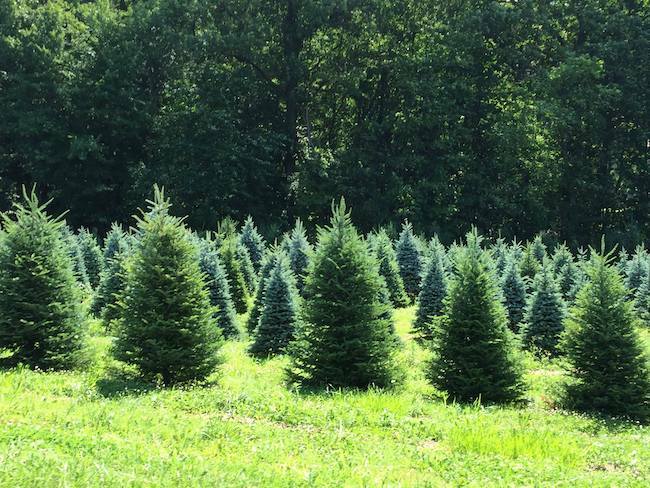 Located in Sykesville, Pine Valley is open Monday through Thursday from 11 a.m. to 5 p.m., and Friday through Sunday from 9 a.m. to 5 p.m.
Have you found a great local farm or Christmas tree lot where you like to get your holiday tree? Let us know in the comments below! Black Cake is a rich Christmas treat that you need to start working on now. Get the recipe here!